Enough cold water to cover the pears. Peel the pears with a potato peeler, taking care to leave the stems intact. Put the water, the sugar and the ginger in a saucepan and slowly bring to a simmer until the sugar is dissolved. Add the pears and peperoncino and poach for about half hour until their are soft and cooked through. Set aside and leave the pears to cool in the syrup. 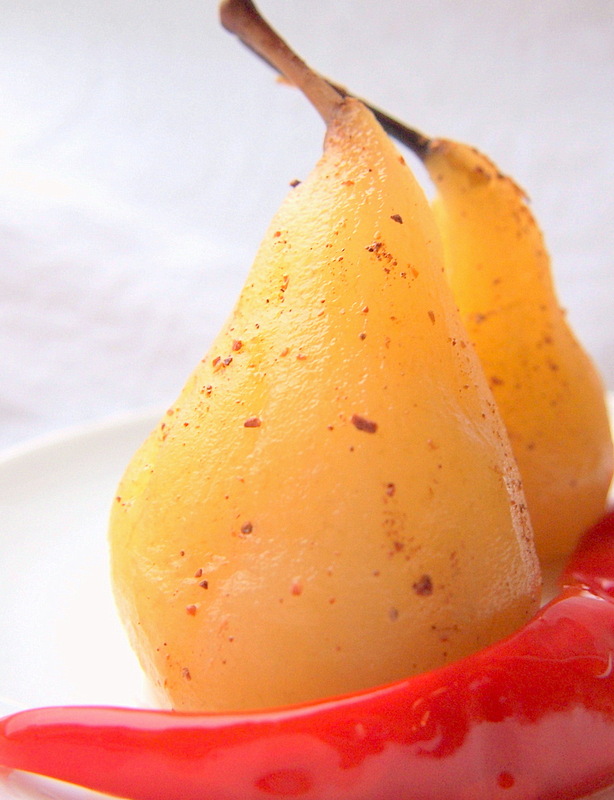 When you are ready to serve, just put the pears in the plate and sprinkle them with the star anise dust. If you want, you can bubble the syrup for a a few more minutes to thicken a bit and serve with the pears. Or, you can prepare a chocolate sauce (just melt the chocolate in bain marie, with a bit of butter, being careful not to boil it. Add some cream and mix well). Add a pinch of cayenne pepper for an extra quick. This might be a lot to ask, but is there anyway I can get the stats on this recipe? Calories; sugar; carbs, etc. I don’t normally count calories… tried to find the original recipe for you and it also didn’t have any stats. Maybe checking the individual ingredients in places like a http://www.caloriecount.com/calories-pears-i9252 could do the trick? Ok, thanks. That’s what I’ll do.